This week in our Foreign Student Series, we continue our discussion of college entrance tests in the United States. There are two competing admissions tests at the undergraduate level: the SAT and the ACT. We talked last week about the SAT. The reasoning test involves mathematics and language and includes writing an essay. You can also take SAT subject tests. The ACT is designed to measure what a student learned in high school. There are questions in four skill areas: math, English, reading and science. The ACT takes just over four hours. It costs fifty-six dollars to take outside the United States. A writing test -- which is not required -- adds thirty minutes and fifteen dollars. Details about the ACT can be found at act.org. ACT used to be short for American College Testing; SAT once meant Scholastic Aptitude Test. But today the letters no longer stand for anything. Most American colleges and universities require applicants for a bachelor's degree to take one of the tests. Some students take both. The ACT is advertised as "America's most widely accepted college entrance exam." The SAT is advertised as the one "most widely taken" and, combined with high school grades, "the best predictor of college success." Yet activists have long debated the fairness of these tests and what they really show. 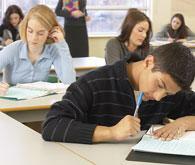 The issue has intensified as the test preparation industry has grown. Now, some colleges and universities have stopped requiring the tests. A group called FairTest has found almost eight hundred schools where students may be able to gain admission without the SAT or ACT. The list is at fairtest.org. For graduate-level programs, applicants often have to take the Graduate Record Examinations, or GRE. The general test measures reasoning, thinking and writing skills. The cost outside the United States is one hundred seventy dollars -- except in China, Taiwan and South Korea. The cost there is one hundred ninety-five dollars.Students can also take GRE subject tests. Information about the GRE can be found on the Educational Testing Service Web site, ets.org. The two major language tests for non-native English speakers are the TOEFL and the IELTS. These will be our subject next week. And that's the VOA Special English Education Report, written by Nancy Steinbach. Our Foreign Students Series is online at www.unsv.com. I'm Steve Ember.